Q: Are you a registered Architect ? A: Yes we are. You can find our registration details on the 'COUNCIL OF ARCHITECTURE(COA)' which holds the information for every registered architect in INDIA. To know our status of registration please click here . To be listed on this site you have to be an architect and there is a professional code of conduct that we are expected to follow. Q: What scale and type of projects do you undertake ? A: For an idea of the project size & typology we have worked on see the Works section of our website. We typically design projects such as single family residences, townships, Hospitality segments, Industries etc. We have experience in commercial work and are interested in being considered for these types of project as well. Please explore this website for images of recent projects. Q: What happens at the initial consultation? A: The initial consultation is a time for us to discuss your requirements and to see if you feel we are the right Architect for your project. At this time we will discuss your ideas and concepts and our experience and capabilities to deliver what you require. Q: Do we have to travel down to your office to meet you? A: At first , telephone /online chatting could start conversations on design and projects. However, meeting in person is always encouraged to get to know us and our methods of working. Q: Will you share with me a portfolio of similar projects and provide a list of client references? A: Absolutely. During the first meeting we do share our portfolio which has all our ongoing and completed projects. We will also gladly provide a List of References upon your request. Q: Can we see any of your built works? A: We can guide you to our projects that are under construction. Nevertheless , we prefer to respect the clients’ privacy and let you access only the documentation of the project (photographs or videos of our project available with us) that are already built. Q: Can you do only our elevation ? If we already have a design could you detail ? We do not design elevations or plans separately. We undertake only comprehensive design projects which involves Architecture /Complete Interiors/ Landscape design. Q: Procedure to get an appointment . A: If the client is comfortable with our ideas and working style ,we’d be glad to meet them at our office. All that is needed is to fill in a short form to get an appointment. Please click here to fill up the inquiry form. Q: What would be a rough estimated timeline for the project from start to finish ? A: The design process depends a lot on you; how easily you make decisions, how regularly we can meet etc. But, generally it takes about 2-3 months for the design process. Construction time will depend on the extent of the work but we can make an estimate early on in the process. It is important to try to be realistic at this point and throughout the project. There are lots of things that can speed it up and slow it down, which we can discuss further, but we would like to add that since you are making a huge investment in time, money and in yourselves, it is important to get it right. Q: Who from the architecture firm will I be coordinating with on a regular basis? A: While we approach each project in a studio atmosphere promoting collaboration and insight from every member of our organization, a firm principal is always the project team leader and makes all final decisions regarding building aesthetic and function and will remain your primary contact throughout the project. Q: Do I need to hire any other consultants ? A: Many architectural projects will require the design services of a licensed Structural engineer. We may also recommend hiring a Mechanical engineer to prepare drawings and specifications if you are interested in incorporating complex heating/ventilation/cooling systems. We typically recommend consultants to work with unless you know of someone you’d like to work with. Some projects require assembling a team of consultants including an MEP Engineer & Landscape architect. We can assist you in choosing compatible individuals for a professional design team. We encourage having necessary consultants involved early in the design process and have found that a collaborative effort will produce the best results. Q: What is your design philosophy ? A: At WARP we provide project centric design solutions. We also believe that architecture has the power to enrich humanity. Our practice involves extensive process in sculpting simple design parcels with a strong belief in geometry and nature. Each design in our practice has been through a process of interrogating the program, the form and context. We aspire in creating spatial experience by amalgamating engineering and art. Q: What are the steps in design process? A: The process is broken into 4 phases as mentioned below. Q: Can you explain the steps involved in design process ? A: Programming & schematic design. An interview process has been developed that allows us to listen to you fully express your needs and desires. It is the goal of the designer to transfer your ideas and visions into reality. The process begins by developing preliminary design ideas through layouts that illustrate the organization of spaces and how those spaces relate to your project. In this phase the schematic design is refined. General design information from major structural elements to interior finishes are decided upon, as well as, specific design issues addressed and resolved. This phase is the opportune time to get a qualified builder involved. The construction document phase begins when all parties are satisfied with the design presented. It involves the preparation of architectural drawings. These drawings include detailed foundation and floor plans, exterior and interior elevations, structural and electrical layouts and general notes. We will submit the plans to qualified builders for pricing. Each contractor’s budget given for your project will be obtained and reviewed to make certain that the bids received are equal in the scope of work to be performed and are comparable in material specifications. We will make on-site observation visits during the course of construction to ensure that the contractor is building the project in accordance with the intended design concept. We will also be available to answer any questions that may arise on the site, as well as various other duties which are limited to our services proposed. Q: What will we show you along the way to explain the project ? Detailed construction plans and specifications. A: For new construction, our fee is based on a 'percent of the cost of construction' as suggested by COUNCIL OF ARCHITECTURE (COA) . Initially fees are based on your budget. They are adjusted when the concept design are agreed upon and finalized with a signed contract with the builder. WARP is on a par with the best and our fees reflect our professionalism and quality of work. 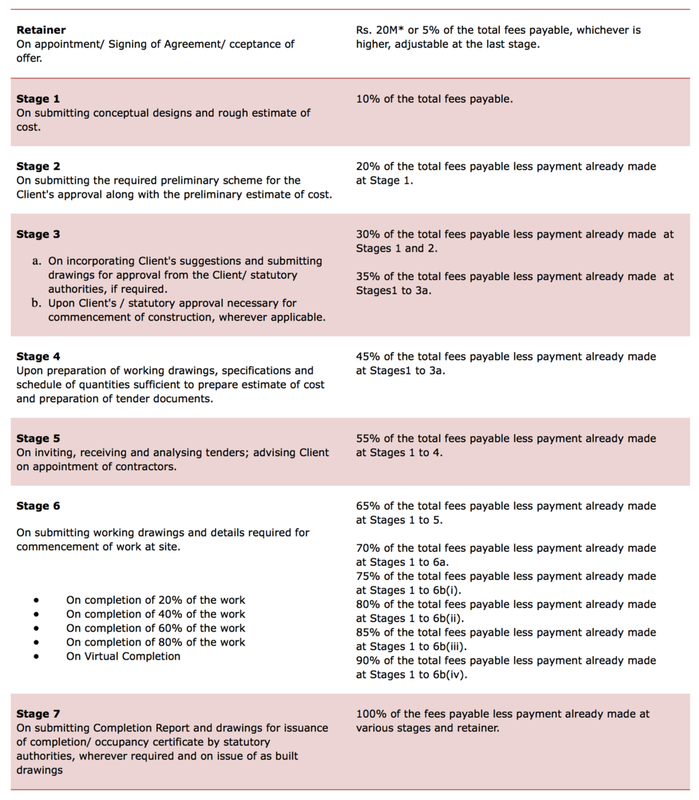 You can check this website is for a reference which will guides you about COA's - Professional Scale of Charges for the services provided by Architects. Q: At what point is the first stage of payment ? A: After the initial discussion at our office we accept a Retainer fee (Advance) to commence the project which varies depending on the project. Q: Can you confirm the scope for your services and what services would incur additional fees? A: Below link is for a reference which will guide you about an Architect's Scope of services & Schedule of Payments. Q: When do we get the ‘Scope of services & Professional Scale of Charges’ from you? A: We deliver a 'Architect-Client Conditions of Engagement' which will include all the following. Q: When do you start with design process for the project? A: We start working on the project immediately after signing project agreement and after we receive a retainer fee. Q: How frequently do you bill, and what are the conditions of payment? Q: Will there be any engineering consultants? Is this included in your fees? A: The charges for Structural & MEP (Mechanical Electrical Plumbing ) Consultants for projects till 25,000 sq.ft are included in our 'Professional Scale of Charges'. Above that we recommend clients to hire a separate structural & MEP consultant whose charges are not included. Q: Do you take up Construction of your designs? A: No we don't take up construction of our projects. In most cases we’ll help you find one or several contractors based on a tender basis to work for your project. Often we’ll recommend a company we’ve worked with in the past or a company we know that has a good reputation. If we haven’t worked with them, we’ll help you determine if they are qualified to construct your project. We’ll help you determine the best process for your project and the appropriate time to select a contractor. Q: Are there builders you prefer to work with, and why? A: Yes, there are several builders that we have worked with over the years and we work with them because they have better understanding of our drawings and produce a high quality product. We are happy to provide a list for you if you would like. We usually start talking to builders in the schematic design phase. Although price is always a part of the process, matching you with a builder whose personality compliments yours and who works in a way that facilitates your needs is what we start to look for as we begin to work together. We are also happy to work with your builder if that is your preference. It is always good to make a good new contact. Q: What is your role during construction? A: As part of our Basic Service agreement, we are "on-call" to answer questions, interpret plans, prepare required change directives, review shop drawing submittals, and clarify the exact design intent on aesthetic. Optional services can include scheduling periodic site visits, prepare reports to the client regarding status of construction, review contractor requests for payment and other administrative duties. Q: Do you assist us in getting quotations for all components? A: Yes. We involve in getting quotations from 2 or 3 experienced vendors for each components. Q: Do you supervise your projects? A: Yes. We supervise & make necessary site visits as per our project schedules & progress of the project to ensure the works are progressed as per drawings released. Q: Do You Provide Project Management Consultancy (PMC) Services? A: We do PMC (Project Management Consultancy) services for projects till 25,000 sq.ft. Above that we recommend clients to hire a separate PMC consultant. Q: How can I involve in Internship? A: Candidate for internship are selected through two tier evaluation process. First, the students are asked to send us their resumes & portfolio of their recent works. The applications are graded by a team and we shortlist the strong candidates. Second, short listed candidates are interviewed and then the final candidates are selected. Q: Will I be notified if I am not selected? A: We do not send out any notice if you have not been selected. Unfortunately, given that we typically receive more number of applications each year for the Jobs & internship Program, we are only able to acknowledge only if your application has been selected. Q: Is internship a full time or a part time? A: Internship will be full time The interns would be expected to work for a minimum of 120 days in our office. : Yes. You could fill the form. Meetings are assigned only on working Saturdays.